Reliance Jio on Thursday announced that Jio Phone users can now avail unlimited voice calls and 1GB 4G data for 28 days at a charge of Rs. 49 as part of its Republic Day 2018 promotions. The telco has also launched data add-ons specifically for Jio Phone at Rs. 11, Rs. 21, Rs. 51, and Rs. 101. The feature phone was launchedback in last July with services such as JioMusic, JioTV, and JioCinema. This comes soon after Jio announced it will offer 500MB more data on the non-Jio Phone plans offering 1GB and 1.5GB data per day. Earlier on Wednesday, Counterpoint Research claimedthat Jio Phone topped the feature phone market in India in the fourth quarter of 2017. The feature phone helped Reliance Jio dominate the market with a share of 26 percent - surpassing Samsung and Micromax, which stood at second and third spots with 15 percent and 9 percent market share in the fourth quarter, respectively. "Reliance Jio captured a 26 percent share of the feature phone segment in just one quarter with its compelling value proposition compared to the normal 2G feature phones," Counterpoint Associate Director Tarun Pathak had said in a statement, adding that the telco exited the quarter with some inventory in the fourth quarter that could affect its share in the coming quarters. 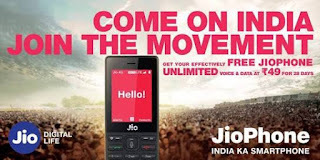 The 4G and VoLTE-enabled Jio Phone disrupted the market of feature phones through its "free" model in which customers need to deposit money of Rs. 1,500. This upfront amount is refundable after three years. Competing against Reliance Jio, Bharti Airtel, BSNL, and Vodafone also brought their affordable feature phone and entry-level smartphone models to the Indian market. The KaiOS-running Jio Phone features a 2.4-inch display with 240x320 pixels resolution and is powered by a 1.2GHz dual-core processor, coupled with 512MB RAM. The phone has a 2-megapixel rear camera sensor and a 0.3-megapixel front camera sensor and packs a 2000mAh battery.